Until Beatlemania hit, the default type of guitar played in Russia was quite different to those used everywhere else. The Russian guitar has a long and distinguished history almost entirely unknown to modern western musicians. And I've got one. By the end of the 18th century, the 5-course double-strung guitar of the baroque period was becoming rather unfashionable. Whether this was due to the social upheaval of the era's anti-monarchist revolutions or simply because of improvements in string-making technology, I couldn't tell you. But it happened quickly, and for a brief period there were competing versions of what the guitar would be: 4-course, 6-course, 5-string, 6-string, or 7-string. One especially influential musician in Russia, Andrei Sychra, favoured seven strings, tuned DGBdgbd'. Far from being a cultural dead end, the music was widely heard and appreciated across europe until the Russian revolution. The particular style of the early russian instruments may even have proved a decisive influence on Johann Stauffer's famous scroll-headed guitars, and not the other way around. I bought this particular guitar in 2008, from a pirate vendor selling his wares (mostly old plumbing and electrical odds and ends) from a card table by the streetcar tracks, just beyond the "official" market, in Odessa, Ukraine. It was in rough shape, but for 70 Hryvnas (maybe $15 at the time) I couldn't resist. I put some strings on it, but it has basically stayed in its original unplayable state ever since then. Time to rectify the situation. 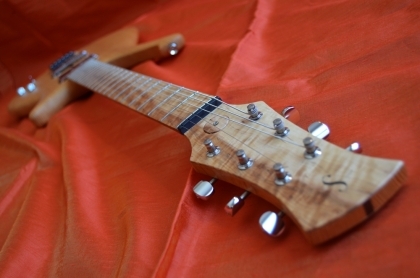 This guitar was made in a soviet factory, a product of the planned industrial economy. It displays no echoes of greatness. To be fair, for 8 rubles 50 kopeks, nobody expected it to. There were two official quality levels of guitar, and this was the lower one. Still, it has a top made of solid wood. Spruce, pine, fir, who knows exactly what. Not bookmatched, but joined so well it's hard to tell. The back and sides are a plain grade of birch plywood, all treated to a perfunctory sunburst finish. The bindings are dyed or toasted solid wood, while the neck is carved from a monolithic chunk of beech. It's been dyed and painted black, like the bridge, which charmingly uses a piece of brass fretwire for the saddle. The fretwire is brass, and surprisingly beefy. If only they'd made it with barbed tangs; I pressed and glued in the many loose frets. The neck is where we see the ancestral influence shared with Stauffer's guitars. Not only is the neck japanned black, the flying fingerboard extension is identical. And is that an action adjustment mechanism in the heel? That explains a lot about why it was so unplayable. The bolt also had a square head- fortunately, it fits perfectly to a standard drum tuning key (probably no accident). It would be a shame to lose that funky aspect of the guitar, so I've got to find a way to keep the bolt while drastically improving the neck/body joint. I also don't want to glue the neck in; there's no bone saddle, so I can't file it to fine-tune the action. And again, I don't want to lose the fretwire saddle, since that is also part of the charm of the instrument. Some sort of adjustable neck joint is essential. This prevents the neck from sliding upward, while acting as a fulcrum to allow it to rotate very slightly forward or backward. The main mortice holds the neck in alignment in all other axes. That single bolt is now only under tension, acting opposite the strings, and can be loosened to raise the action, or tightened to lower it. I worried that pulling back on the neck could inadvertantly turn the neck into a giant whammy bar, but it turns our the tension and friction in the system are high enough that it doesn't happen at all. I think it's pretty clever.